Enterprises rely on ReviewTrackers not only to collect online reviews and customer feedback — but to use that data to paint a complete, accurate picture of the entire customer journey. Powered with this data, you can measure and improve your company’s customer experience. All-in-one CX dashboard. Smart (and timely) alerts, simplified feedback management, and front-line survey and response tools designed to help you learn from the customer and deliver experiences that will resonate with them. Customer journey analytics. Empower your team to connect the dots and visualize the entire customer journey. Plus: smart data filtering brings to the surface key CX trends at the local, region, and brand level. Text analytics and sentiment analysis. Best-in-class natural language processing (NLP) and machine learning technology analyzes customer data and makes sense of massive amounts of feedback, helping you understand not only what customers are talking about — but also how they really feel. 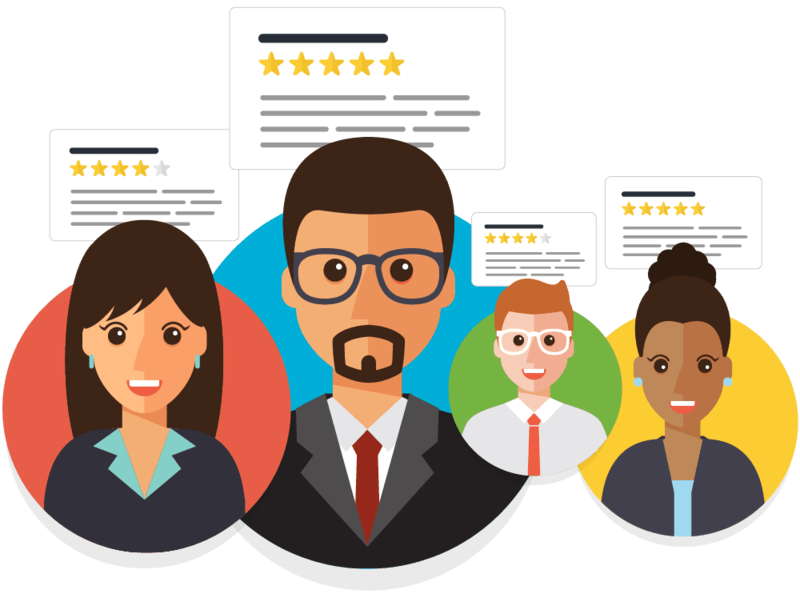 ReviewTrackers’ customer experience dashboard pairs structured data (star rating) with information that’s typically difficult to analyze (text and sentiment in online reviews) allowing you to discover high-impact CX trends, patterns, and issues contained in reviews and feedback. Our technology is able to parse your reviews and highlight relevant data around particular topics. So if you’re concerned about the wait times at your restaurant franchise or the ATMs at your bank, you’ll be able to dig in for the insights you need. ReviewTrackers connects you to the voices that matter the most. We do more than collect customer feedback; we interpret it for you the way the human brain interprets language. That way, you understand — at a glance and at scale — exactly what your customers are saying. Capture the Voice of the Customer and discover trends and patterns that define their experience. 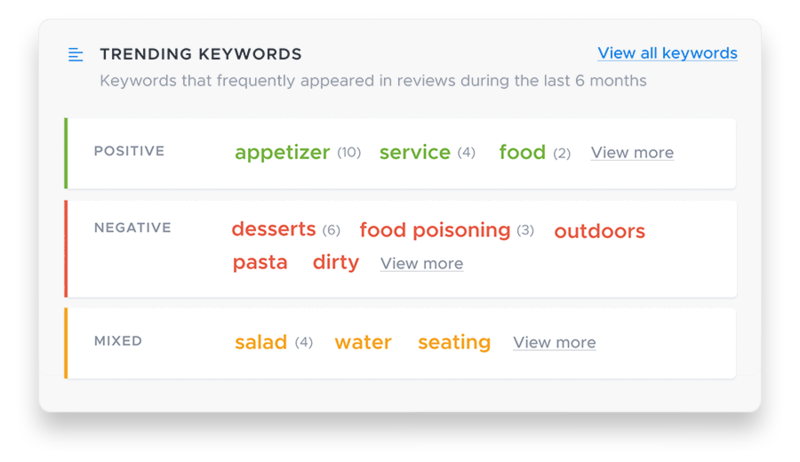 Trending Topics surfaces the most relevant keywords used by your customers in their online reviews. Simply put: it helps your entire team — from the C-suite to the frontline — find meaning in online reviews and customer feedback. Analyze your customer sentiment and see — more clearly than ever — what customers like and dislike about your brand. Through proprietary relevancy scores, ReviewTrackers provides measurement of positive and negative language, with unparalleled accuracy.